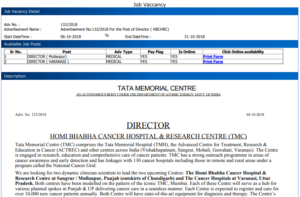 TMC Director Recruitment 2018: Last Date 30 October, PG Jobs Online – Tata Memorial Centre, an autonomous body under the Department of Atomic Energy, Government of India, in October 2018 released the official job vacancy recruitment notification PDF by Director – Homi Bhabha Cancer Hospital and Research Centre (TMC). The official job vacancy recruitment notification PDF and scrutinized and undersigned by P K Sukumaran, HR & Admin. Co-Ordinator. The application forms or registration form filling procedure was declared to be Online only keeping official website to Apply online was www.tmc.gov.in. Board of the controller of recruitment and examinations, Tata Memorial Centre already revealed in the notification that Hard copy of the online application will be received by the bench within eight days from the last date that is 8 November 2018. And, as the last date to fill the Application Form was 31 October 2018. The candidates who were previously employed in Government and Autonomous bodies will be given the relaxation in the age with exceptional merit and ex-servicemen as well. Otherwise, the preferable age limit for the selection as Director will be between 45 years and 55 years. 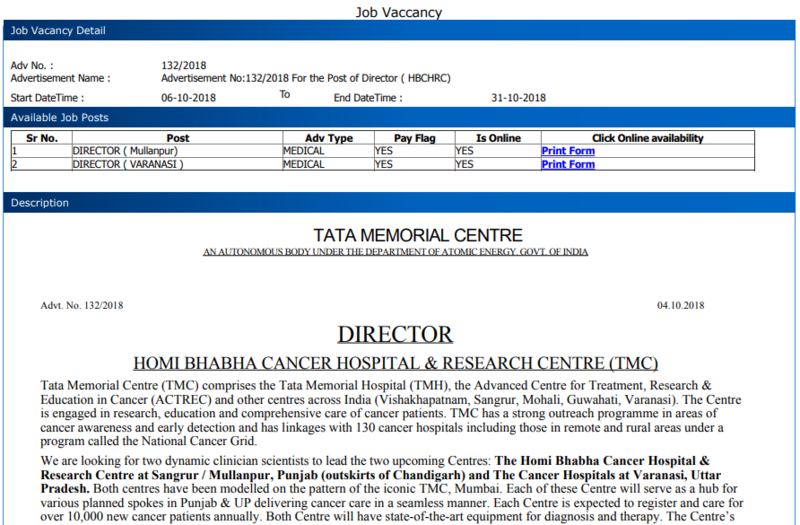 The purpose of recruitment is primarily that the two dynamic clinical scientists will join upcoming centres that is – The Homi Bhabha Cancer Hospital and Research Centre at Sangrur/ Mullanpur, Punjab (outskirts of Chandigarh) and The Cancer Hospitals at Varanasi, Uttar Pradesh etc.